Is F1 the right fit for Vietnam? Come April 2020, Vietnam will become the third country in ASEAN to host a Formula 1 Grand Prix – a major status symbol for the Communist state. Joining the ranks of Malaysia and Singapore, the Vietnamese Grand Prix will be the first new event on the Formula 1 calendar since Liberty Media took over ownership of the F1 franchise in early 2017 amidst its bid to expand into more global markets. Featuring a street circuit weaving through the heart of Hanoi, the race promises to be the country’s most powerful tourism advertisement of the year and boost investment numbers which are already the best in the region. But in a country where racing takes a back seat to more popular sports such as football, and the fact that none of the 18 drivers from the nine teams come from Asia – the race holds limited appeal for the average Vietnamese, most of whom ride motorcycles rather than cars. Although Formula One attracted a global cumulative audience of 1.7 billion viewers in 2018, a rise of 10 percent from 2017 across television and digital platforms, Vietnam was not even among the top-20 markets in terms of viewership. While Vietnamese officials are confident advertising revenue from the multi-year race would potentially cover the cost of the event, Formula One races are notoriously expensive and pose a huge financial risk in terms of investment and infrastructure. 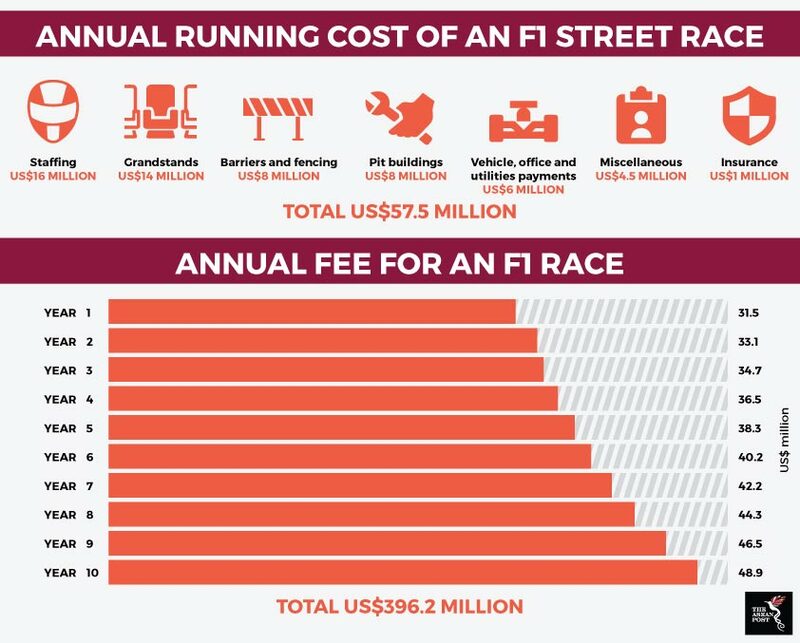 Combined with the hefty race fees demanded by Formula One commercial rights holders Liberty Media, and the uncertainty surrounding TV rights revenue sharing for the event, local organisers should be well aware they have their work cut out for them to make the race profitable. Vietnam only has to look to Malaysia, which became the first Southeast Asian country to host the race in 1999, for reasons to be cautious. The glitzy Singapore Grand Prix stole the limelight away from Malaysia, which hosted Asia’s second-oldest race after Japan but was unable to compete with their southern neighbours. Poor attendance records – Sepang’s grandstands which are designed to hold 120,000 spectators only drew 45,000 in 2016 – meant the dream ended after 19 seasons. Although the Sepang International Circuit's CEO Razlan Razali said the final race in 2017 sold 65 percent more tickets than in 2016, it was largely due to a reduction in ticket prices for locals by more than 82 percent. Malaysia spent US$67 million to host the race each year, with the government footing most of the bill. "Last year (2016) was the lowest (attendance) in our history and also lowest in TV viewing. Hence in these trying times we advised the government, let's stop it," Razali said in 2017. Races in South Korea – where the custom-built race track is only used for one week a year when Formula One comes to town – and India were also money-losing exercises for their organisers and governments. The cancellation of the Malaysian Grand Prix cemented the status of MotoGP – motorcycling’s answer to Formula One – as the motorsport event of choice in Malaysia. It has been organised in Malaysia every year since 1991, and in 2017, a record 166,486 fans attended the three-day event at the Sepang International Circuit. The rise of several local riders has also given the crowd more reason to cheer. In Thailand, last year’s inaugural Thai MotoGP drew the 2018 MotoGP calendar’s biggest crowd of 222,535 fans and gave the government a healthy injection of revenue. “The government pays only 100 million baht (US$3.2 million) for licence fees but around 3 billion baht (US$94.5 million) has been generated in Buriram and nearby provinces,” beamed Thailand’s Minister of Tourism and Sports, Weerasak Kowsurat. Thus, it is no surprise for MotoGP fans to learn that Indonesia – one of the world’s largest motorcycle markets – will become the latest ASEAN country to join the MotoGP bandwagon in 2021 when it hosts a race in Lombok. Despite Formula One’s dismal record in the region and the potential for white elephants, the sports’ officials remain steadfast in their support for the Vietnamese Grand Prix. "We are thrilled to be here in Hanoi, one of the most exciting cities in the world right now with such a rich history and an incredible future ahead of it,” said Chase Carey, Liberty Media’s chairman. "Since we became involved in this sport in 2017, we have talked about developing new destination cities to broaden the appeal of Formula One and the Vietnamese Grand Prix is a realisation of that ambition,” he added. As noble as Carey’s ambition may seem, it is a self-serving one that may not be shared by many Vietnamese.